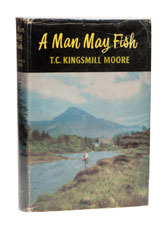 Written in 1960, but with the quality of the great thirties literature, A Man May Fish has a character all of its own and has to be one of the best books about fishing ever written. This is probably a reflection of the character of the author, an extraordinary man who among many other achievements served as a judge in Irish Supreme Court and who only died a few years ago. The book begins with the statement: 'It may have been fortunate that fishing was not made too easy.' It ends with a frustrating hint at all the other stories he could have told - '... of the magician of Fermoyle (though that was only one of Jamesie's tales); of the house abandoned when the roof was ready because it had been built across a fairy pass; of the lad who described to me how, as a boy, he had been taken away by the fairies and returned by them because he would not eat or drink, none the worse save that he was deaf and dumb for a fortnight - indeed rather the better for the fairies had given him the whisper and the touch for a sick cow; of the fears and hauntings of that wild upland, and the great grey boulders that play grandmother's steps with you as the night closes in.' In between it is solid gold.